Baqersad, K. Bharadwaj, “Strain Expansion Reduction Approach”, Mechanical Systems and Signal Processing Journal, Vol. 101, Pages 156-167- February 2018. Patil, J. Baqersad, M. Behroozi, “Experimental Modal Analysis on a Tire – Lessons Learned”, in-press, International Journal of Vehicle Noise and Vibration (IJVNV), November 2017. Baqersad, P. Poozesh, C. Niezrecki, and P. Avitabile, “Full-Field Optical Measurement Techniques in Structural Dynamics – A Review”, Mechanical Systems and Signal Processing, Special Issue: Non Contact Measurement, Vol. 86, Part B, Pages 17–34, 10.1016/j.ymssp.2016.02.011, 2017 (Invited). Aizawaa, P. Poozesh, C. Niezrecki, J. Baqersad, M. Inalpolat, G. Heilmannc, “Structural Health Monitoring of Wind Turbine Blades using Acoustic Microphones”, Structural Health Monitoring Journal, 10.1177/1475921716676871, 2017. Baqersad, C. Niezrecki, and P. Avitabile, “A Non-Contacting Approach for Full-Field Strain Monitoring of Rotating Structures”, ASME Journal of Vibration and Acoustics Vol. 138, Pages 031008-031008-9, 10.1115/1.4032721, 2016. Poozesh, J. Baqersad, C. Niezrecki, P. Avitabile, E. Harvey, and R. Yarala, “Large-area Photogrammetry Based Testing of Wind Turbine Blades” Mechanical Systems and Signal Processing Journal, 10.1016/j.ymssp.2016.07.021, 2016. Baqersad, C. Niezrecki, and P. Avitabile, “Extracting Full-Field Dynamic Strain on a Wind Turbine Rotor Subjected to Arbitrary Excitations using 3D Point Tracking and a Modal Expansion Technique”, Journal of Sound and Vibration, Vol. 352, Pages 16-29, 10.1016/j.jsv.2015.04.026, Sound and Vibration Journal, 2015. Baqersad, C. Niezrecki, and P. Avitabile, “Numerical and Experimental Analysis of the Boundary Conditions Effects on the Dynamics of Wind Turbines”, Wind Engineering Journal, V39 (4), 437–452, 2015. 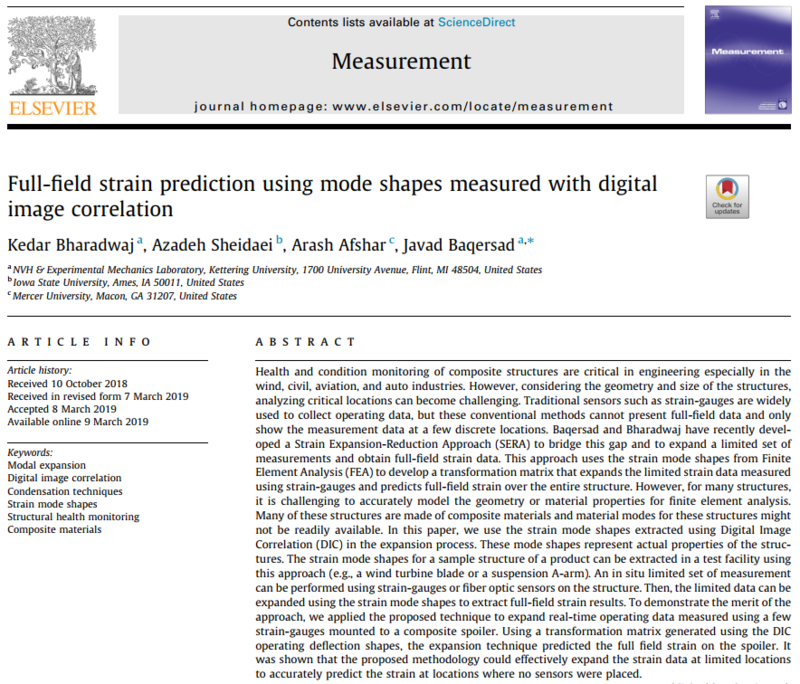 Baqersad, C. Niezrecki, and P. Avitabile, “Full-Field Dynamic Strain Prediction on a Wind Turbine using Displacements of Optical Targets Measured by Stereophotogrammetry”, Mechanical Systems and Signal Processing Journal, Vol. 62–63, Pages 284-295, 10.1016/j.ymssp.2015.03.021, 2015. Lundstrom, J. Baqersad, and C. Niezrecki, “Monitoring the Dynamics of a Robinson R44 Helicopter Main Rotor with High-Speed Stereophotogrammetry”, Experimental Techniques Journal, 10.1111/ext.12127, 2015. E. Obando, J. Baqersad, and P. Avitabile, “Improved Modal Characterization Using Hybrid Data” Sound and Vibration, V. 48, 8-12, 2014. Carr, J. Baqersad, C. Niezrecki, and P. Avitabile, “Full-Field Dynamic Strain on Wind Turbine Blade Using Digital Image Correlation Techniques and Limited Sets of Measured Data from Photogrammetric Targets” Experimental Techniques Journal, 10.1111/ext.12129, 2014. Mashhadi, A. Kakaee, J. Baqersad, “Vibration Characteristics of Continuously Variable Transmission Push Belts” Iranian Journal of Science and Technology Transactions of Mechanical Engineering, V. 39, 77-82, 2013. Srivastava, K. Patil, J. Baqersad, “A Multi-View DIC Approach to Extract Operating Mode Shapes of Structures” 36th IMAC, A Conference on Structural Dynamics, FL, 2018. Patil, J. Baqersad, J. Bastiaan, Effects of Boundary Conditions and Inflation Pressures on the Natural Frequencies and 3D Mode Shapes of a Tire, SAE Noise and Vibration Conference, Grand Rapits, MI, 2017. Patil, J. Baqersad, A. Sheidaei, “Extracting Mode Shapes of a Tire Using Digital Image Correlation” 35th IMAC, A Conference on Structural Dynamics, CA, 2017. Bharadwaj, J. Baqersad, “Modal Expansion using Strain Mode Shapes”, 35th IMAC, A Conference on Structural Dynamics, CA, 2017. Moeenfard, M. Khadembashi, A.H. Ghasemi, J. Baqersad “Analytical Modeling of a Piezoelectric Energy Harvesters Under Random Base Excitation”, 35th IMAC, A Conference on Structural Dynamics, CA, 2017. Malaeke, H. Moeenfard, A.H. Ghasemi, J. Baqersad “Vibration Suppression of MR Sandwich Beams Based On Fuzzy Logic”, 35th IMAC, A Conference on Structural Dynamics, CA, 2017. Sheidaei, Y. Dong, J. Baqersad, “Joining Aluminum to Aluminum and Dissimilar Materials – a New Course Development for Designers and Technicians”, ASEE Zone 2 Spring Conference, PR, 2017. Dong, A. Sheidaei, J. Baqersad, “Design with Composite Materials – a New Course Development for Designers and Technicians” ASEE Zone 2 Spring Conference, PR, 2017. Patil, J. Baqersad, D. Ludwigsen, “Extracting Vibration Characteristics of a Guitar Using Finite Element, Modal Analysis, and Digital Image Correlation Techniques”, The 5th Joint meeting of the Acoustical Society of America and the Acoustical Society of Japan, HI, 2016. Poozesh, J. Baqersad, C. Niezrecki, and P. Avitabile, “Practical Techniques for Scaling of Optically Measured Operating Deflection Shapes” 34th IMAC, A Conference on Structural Dynamics, Orlando, FL, 2016. Dong, A. Mazzei, J. Baqersad, and A. Sheidaei, “How To Join Fiber-Reinforced Composite Parts –An Experimental Investigation” SEM Annual Conference and Exposition on Experimental and Applied Mechanics, The Composites and Advanced Materials, Orlando, FL, 2016. Baqersad, P. Poozesh, C. Niezrecki, and P. Avitabile, “Full-Field Strain Monitoring of a Wind Turbine Using Very Limited Set of Displacements Measured with Three-Dimensional Point Tracking” 27th ASME Conference on Mechanical Vibration and Noise (VIB), Boston, MA, 2015. Poozesh, J. Baqersad, C. Niezrecki, and P. Avitabile, “A Multi-Camera Stereo DIC System for Extracting Operating Mode Shapes of Large Scale Structures” SEM Annual Conference and Exposition on Experimental and Applied Mechanics, The Composites and Advanced Materials, Costa Mesa, CA, 2015. Baqersad, P. Poozesh, C. Niezrecki, and P. Avitabile, “Extracting Full-Field Dynamic Strain Response of a Rotating Wind Turbine Using Photogrammetry” SPIE/NDE, San Diego, CA, 2015. Aizawaa, P. Poozesh, C. Niezrecki, J. Baqersad, M. Inalpolat, G. Heilmannc, “Wind Turbine Blade Health Monitoring Using Acoustic Array Measurements Techniques” SPIE/NDE, San Diego, CA, 2015. Baqersad, C. Niezrecki, and P. Avitabile, “Predicting Full-Field Strain on a Wind Turbine for Arbitrary Excitation Using Displacements of Optical Targets Measured with Photogrammetry” 33rd IMAC, A Conference on Structural Dynamics, Orlando, FL, 2015. Baqersad, P. Poozesh, C. Niezrecki, and P. Avitabile, “Comparison of Modal Parameters Extracted Using MIMO, SIMO, and Impact Hammer Tests on a Three-Bladed Wind Turbine” 32th IMAC, A Conference on Structural Dynamics, Orlando, FL, 2014. Baqersad, C. Niezrecki, and P. Avitabile, “Prediction of Full-Field Dynamic Strain on a Three-Bladed Wind Turbine using Three-Dimensional Point Tracking and Expansion Techniques” SPIE/NDE, San Diego, CA, 2014. Baqersad, C. Niezrecki, and P. Avitabile, “Effects of Boundary Conditions on the Structural Dynamics of Wind Turbine Blades. Part 1: Flatwise Modes” 32th IMAC, A Conference on Structural Dynamics, Orlando, FL, 2014. Baqersad, C. Niezrecki, and P. Avitabile, “Effects of Boundary Conditions on the Structural Dynamics of Wind Turbine Blades. Part 2: Edgewise Modes” 32th IMAC, A Conference on Structural Dynamics, Orlando, FL, 2014. Poozesh, J. Baqersad, C. Niezrecki, and P. Avitabile, “Full Field Inspection of a Utility Scale Wind Turbine Blade Using Digital Image Correlation” CamX, The Composites and Advanced Materials, Orlando, FL, 2014. Avitabile, J. Baqersad, and C. Niezrecki, “Using Digital Image Correlation and Three Dimensional Point Tracking in Conjunction With Real Time Operating Data Expansion Techniques To Predict Full Field Dynamic Strain On A Three Bladed Wind Turbine Assembly” The 11th AIVELA Conference, Ancona, Italy, 2014. Baqersad, T. Lundstrom, C. Niezrecki, and P. Avitabile, “Measuring the Dynamics of Operating Helicopter Rotors and Wind Turbines using 3D Digital Stereophotogrammetry” 69th American Helicopter Society International Annual Forum, 2250-2256, Phoenix, AZ, 2013. Baqersad, C. Niezrecki, P. Avitabile, and M. Slattery, “Dynamic Characterization of a Free-Free Wind Turbine Blade Assembly,” 31st International Modal Analysis Conference on Structural Dynamics, IMAC 31st, 303-312, Orange County, CA, 2013. Lundstrom, J. Baqersad, and C. Niezrecki, “Using High-Speed Stereophotogrammetry to Collect Operating Data on a Robinson R44 Helicopter,” 31st International Modal Analysis Conference on Structural Dynamics, IMAC 31st, 401-410, Orange County, CA, 2013. Carr, J. Baqersad, C. Niezrecki, P. Avitabile, and M. Slattery, “Predicting Dynamic Strain On Wind Turbine Blade Using Digital Image Correlation Techniques in Conjunction with Analytical Expansion Methodologies” 31st International Modal Analysis Conference on Structural Dynamics, IMAC 31st. 6, 295-302, Orange County, CA, 2013. Lundstrom, J. Baqersad, C. Niezrecki, and P. Avitabile, “Using High-Speed Stereophotogrammetry Techniques to Extract Shape Information From Wind Turbine/Rotor Operating Data” 30th IMAC, A Conference on Structural Dynamics, 6, 269-275, Jacksonville, FL, 2012. Carr, J. Baqersad, C. Niezrecki, P. Avitabile, and M. Slattery, “Dynamic Stress-Strain on Turbine Blade Using Digital Image Correlation Techniques Part 1: Static Load And Calibration” 30th IMAC, A Conference on Structural Dynamics, 2012. 2, 215-220, Jacksonville, FL, 2012. Carr, J. Baqersad, C. Niezrecki, P. Avitabile, and M. Slattery, “Dynamic Stress-Strain On Turbine Blades Using Digital Image Correlation Techniques Part 2: Dynamic Measurements” 30th IMAC, A Conference on Structural Dynamics, 2012. 2, 221-226, Jacksonville, FL, 2012. Baqersad, J. Carr, T. Lundstrom, C. Niezrecki, P. Avitabile, and M. Slattery, “Dynamic Characteristics of A Wind Turbine Blade Using 3D Digital Image Correlation” Health Monitoring of Structural and Biological Systems 2012. 8348 SPIE/NDE, San Diego, CA, 2012. Mashhadi, J. Baqersad, “Vibration Modeling of Surface to Surface Contact in CVT Bands”, Proceeding of Third International Conference on Modeling, Simulation, and Applied Optimization, (IEEE Conference) Sharjah, U.A.E, 2009. Mashhadi, J. Baqersad, “Contact Modeling Between Segments In CVT Push-Belts, Proceeding of the Third Conference on Mechanical Engineering”, Isfahan, Iran, 2008. Birajdar, J. Baqersad, M Behroozi, “Effect of cam parameters in the tandem cam enveloping model on short obstacles using DOE approach”, 2017 Annual Conference of the TIRE Society, Akron, OH, 2017. Kandampadath, J. Baqersad, “Ride Performance using KU SWIFT-Based Tire Model”, Flint Student Research Conference, University of Michigan Flint, MI, 2017. Chang, M. Peterson, J. Baqersad, “Measuring Dynamic Deformation of a Tire using DIC”, Flint Student Research Conference, University of Michigan Flint, MI, 2017. Birajdar, J. Baqersad, J. Bastiaan, “KU-Tire Model for Transient Forces under Longitudinal Slip based on Relaxation Length”, Flint Student Research Conference, University of Michigan Flint, MI, 2017. Wesley, J. Baqersad, “Measuring Inflation Pressure of a Tire Using a Microphone”, Flint Student Research Conference, University of Michigan Flint, MI, 2017. Vivekananda Panchal, J. Baqersad, “Finite Element Modeling of Skin for Vibration Analysis”, Flint Student Research Conference, University of Michigan Flint, MI, 2017. Mange, J. Baqersad, “Experimental Modal Test on a Model Airplane”, Flint Student Research Conference, University of Michigan Flint, MI, 2017. Khadka, J. Baqersad, “Finite Element Modeling and Validation of a Suspension A-arm”, Flint Student Research Conference, University of Michigan Flint, MI, 2017. Srivastava, J. Baqersad, “Multi-view DIC for Measuring Operating Mode Shapes of a Cantilever Beam”, Flint Student Research Conference, University of Michigan Flint, MI, 2017. Bharadwaj, J. Baqersad, “Strain Expansion Methodology”, Flint Student Research Conference, University of Michigan Flint, MI, 2017. Kandampadath, Javad Baqersad, “A Semi-empirical Tire Model for Improved Ride and Comfort Dynamics”, MASAL, Saginaw Valley State University, MI, 2016. Baqersad, K. Patil, “A Multi-View Point-Tracking Technique to Extract Mode Shapes of Structures” iDICs Conference, Philadelphia, PA, 2016. Baqersad, J. Huang, D. Ludwigsen, A. Sheidaei, “Vibration Characteristics of a Guitar Using Finite Element and Digital Image Correlation Techniques”, MASAL, Saginaw Valley State University, MI, 2016.